The Deutschland class was a series of three Panzerschiffe ("armored ships"), a form of heavily armed cruiser, built by the Reichsmarine officially in accordance with restrictions imposed by the Treaty of Versailles. 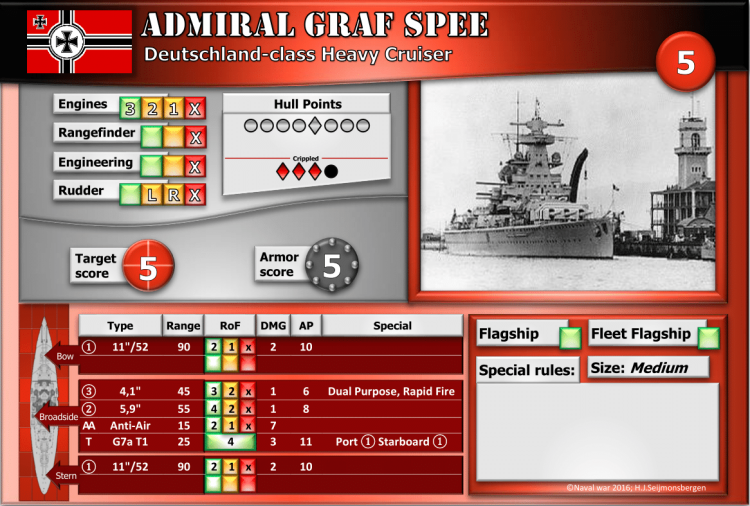 The class, which comprised the ships Deutschland, Admiral Scheer, and Admiral Graf Spee, were all stated to displace 10,000 long tons (10,000 t) in accordance with the Treaty, though they actually displaced 10,600 to 12,340 long tons (10,770 to 12,540 t) at standard displacement. Despite violating the weight limitation, the design for the ships incorporated several radical innovations to save weight. They were the first major warships to use welding and all-diesel propulsion. Due to their heavy armament of six 28 cm (11 in) guns, the British began referring to the vessels as "pocket battleships". The Deutschland-class ships were initially classified as Panzerschiffe or "armored ships", but the Kriegsmarine reclassified them as heavy cruisers in February 1940.